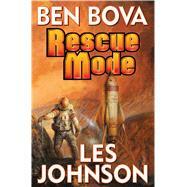 Gritty and scientifically accurate science fiction adventure from New York Times best-selling author Ben Bova and NASA space scientist Les Johnson. The first human mission to Mars meets with near-disaster when a meteoroid strikes the spacecraft, almost destroying it. The ship is too far from Earth to simply turn around and return home. The eight-person crew must ride their crippled ship to Mars while they desperately struggle to survive. On Earth, powerful political forces that oppose human spaceflight try to use the accident as proof that sending humans into space is too dangerous to continue. The whole human space flight program hangs in the balance. And if the astronauts can’t nurse their ship to Mars and back, the voyagers will become either the first Martian colonists—or the first humans to perish on another planet. Ben Bova has written more than one hundred twenty futuristic novels and nonfiction books, and has been involved in science and high technology since the very beginnings of the space age. His Baen books include Mars, Inc. and Laugh Lines. President Emeritus of the National Space Society and a past president of Science Fiction Writers of America, Bova received the Lifetime Achievement Award of the Arthur C. Clarke Foundation in 2005, "for fueling mankind's imagination regarding the wonders of outer space." His 2006 novel Titan received the John W. Campbell Memorial Award for best novel of the year. In 2008 he won the Robert A. Heinlein Award "for his outstanding body of work in the field of literature." Bova is a frequent commentator on radio and television and a widely popular lecturer. His articles, opinion pieces, and reviews have appeared in Scientific American, Nature, The New York Times, The Wall Street Journal, and many other newspapers and magazines. Earlier, he was an award-winning editor and an executive in the aerospace industry. His Grand Tour novels, such as bestseller Mars, combine romance, adventure, and the highest degree of scientific accuracy to show how the human race will expand through the solar system, and the impact this will have on individual human lives and society as a whole. Bova has taught science fiction at Harvard University and at the Hayden Planetarium in New York City, where he has also directed film courses. Bova currently lives in Florida. Les Johnson is a NASA physicist and author. By day, he serves as the Deputy Manager for the Advanced Concepts Office at the NASA George C. Marshall Space Flight Center in Huntsville, Alabama. In the early 2000s, he was NASA’s Manager for Interstellar Propulsion Research and later managed the In-Space Propulsion Technology Project. He was technical consultant for the movie Lost in Space and has appeared on the Discovery Channel series, Physics of the Impossible in the “How to Build a Starship” episode. He has also appeared in three episodes of the Science Channel series Exodus Earth. He is the author of novel Back to the Moon, coauthored with Travis S. Taylor, and the coeditor of the groundbreaking science/science fiction collection Going Interstellar.